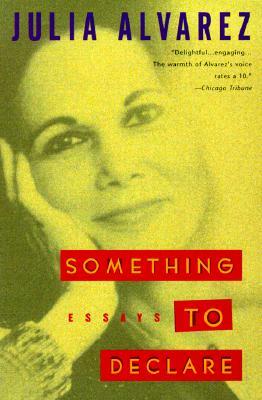 The rich and revealing essays in Something to Declare offer Julia Alvarez's dual meditations on coming to America and becoming a writer. In the first section, "Customs," Alvarez relates how she and her family fled the Dominican Republic and its oppressive dictator, Rafael Trujillo, settling in New York City in the 1960s. Here Julia begins a love affair with the English language under the tutelage of the aptly named Sister Maria Generosa. Part Two—"Declarations"—celebrates Alvarez's enduring passion for the writing life. From the valentine to mythic storyteller Scheherazade that is "First Muse," to a description of Alvarez's itinerant life as a struggling poet, teacher, and writer in "Have Typewriter, Will Travel," to the sage and witty advice of "Ten of My Writing Commandments," Alvarez generously shares her influences and inspirations with aspiring writers everywhere. Julia Alvarez is the author of the novels How the Garcia Girls Lost Their Accents, In the Time of the Butterflies (a national Book Critics Circle Award finalist), and Yo!. She has also published two poetry collections (Homecoming and The Other side/El Otro Lado) and a collection of essays (Something to Declare).